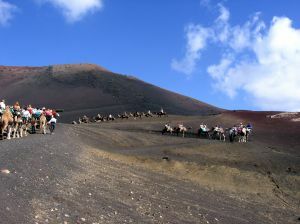 Timanfaya National Park is one of the best Lanzarote attractions for kids. The barren scenery created from the volcanic ash is quite beautiful. At the park you will board a coach for a 45 minute bus ride around the park. Kids will enjoy seeing the water sprout up from the geyser and the steam from the volcano hot spots. There are camel rides for the whole family. Don't miss lunch cooked over the grill that is heated by the volcano at the restaurant. Bring a sweater for everyone as it can get quite windy. Teenagers (and older children) will have a blast learning to surf. There are lots of surf schools on the island offering course for a few hours to a few weeks. Learn to ride the waves in the Canary Islands on your family holidays! Your budding artists will be inspired by Fundacion Cesar Manrique. The home of the famous Canary artist showcases some of his art work as well as some pieces by Picasso. His home is built with the natural landscape. 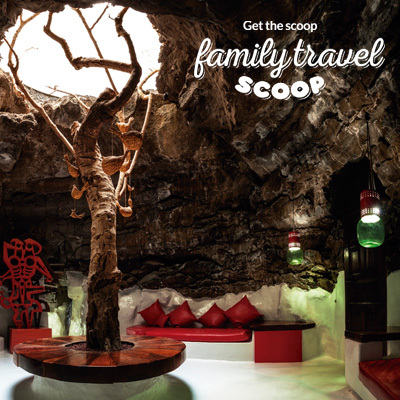 Your children will enjoy exploring the rooms built in the volcanic caves and tunnels. One of the most unique things to do in Lanzarote with children. Toddlers and young children love a visit to Rancho Texas Park. This western themed park has sea lions, parrots, birds of prey and a cowboy show. There are lots of animals to see including white tigers. There is a playground for the kids to climb about on. Jardin de Cactus is another magical work of art by Canary Islands most famous artist Cesar Manrique. 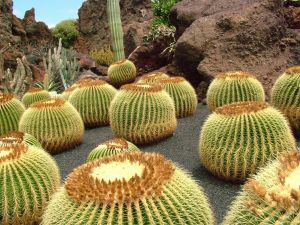 Your family will be delighted seeing the strange shapes of the thousands of cacti here. There is a windmill and cafe here too. Be careful with the little ones as you are free to roam around the prickly cacti. There are also some steep stairs to navigate. Go Karting is one of the fun things to do in Lanzarote with children. Gran Karting Club has battery operated karts for toddlers and young kids under 5. There is a separate track with special karts for children ages 5-10. Fun for the whole family. Enjoy a relaxing stroll at the Marina Rubicon in Playa Blanca with your family. Check out the boats and yachts in the harbor. Stop for a bite to eat at one of the restaurants or do a bit of shopping. There is a market selling local handicrafts on Wednesdays and Saturdays. Kids of all ages will enjoy the Submarine Safari. This semi submerged glass bottomed "submarine" cruises the waters. Check out the underwater sea life including colorful tropical fish, coral and ship wrecks. This tour is great for babies, toddlers and children. Catch the tour at Puerto Calero. This is one of the top things to do in Lanzarote with kids. 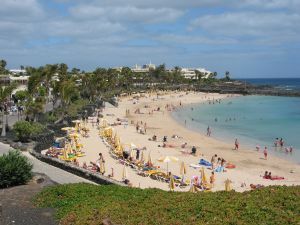 Spending the day at one of the beaches is one of the best things to do in Lanzarote with kids. Build sand castles, splash in the water or watch the local surfers ride the waves! 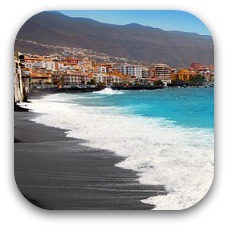 There are over a hundred different beaches and most have a gentle slope making them ideal for children. Just be sure to follow the flag system (Do not enter when red flag, green is a go, and yellow is caution). If you are visiting Lanzarote on a Sunday be sure to head to the Teguise Market for some great souvenir shopping. 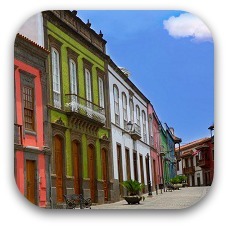 This vibrant market has hundreds of stalls spread around the streets of the town square. Jewelery, local arts and crafts, table cloths, toys and fake watches are found here. Be sure to sample some of the delicious treats that are on offer here. Some days there are farm animals here for the kids to see. Jameos del Agua is another creation of Cesar Manrique. It is an entertainment complex built into the volcanic rock complete with a concert hall in one of the caves. Your children will enjoy seeing the tiny blind albino crabs that can only be found in Lanzarote. There is a lovely restaurant and a volcano museum here too. There is a gorgeous pool that is unfortunately closed to the public. Cool off from the hot sun and spend the day at Aqua Park. This is one of the fun Lanzarote attractions for kids. There is so much fun stuff to do in Lazarote! There are loads of slides and pools for all age groups. Your toddlers and young children will love the kiddie area just for them. This is a fairly basic water-park with a few activities for the kids. Papas Arrugadas are a local Canary Island specialty. Your kids will love these boiled potatoes with a peppery mojo sauce. Check out these other delicious Spanish foods for kids to try on your Lanzarote family holidays! 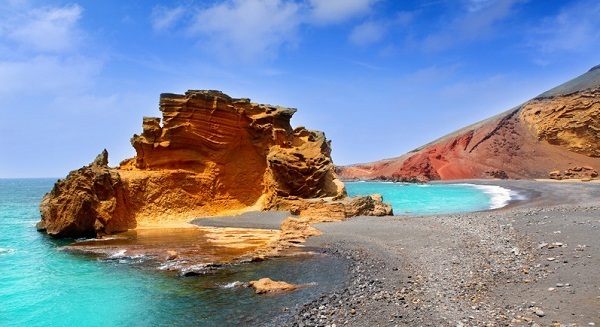 Amazing places to stay for families in Lanzarote! 13 Things to do in Gran Canaria with your children!